1دانشجوی دکتری اگرواکولوژی، دانشکده کشاورزی، دانشگاه فردوسی مشهد. 2استاد گروه زراعت، دانشکده کشاورزی، دانشگاه فردوسی مشهد. 3استادیار گروه پژوهشی زعفران، دانشکده کشاورزی، دانشگاه بیرجند. 4کارشناس ارشد زراعت، دانشکده کشاورزی سرایان، دانشگاه بیرجند. به‌منظور مطالعه اثرات بافت خاک بر عملکرد گل و بنه زعفران، آزمایشی در سال زراعی 93-1392 در دانشکده کشاورزی دانشگاه فردوسی مشهد در قالب طرح بلوک‌های کامل تصادفی با چهار تیمار و چهار تکرار در جعبه اجرا شد. تیمارهای آزمایشی عبارت بودند از: 1- 100% خاک مزرعه + کود گاوی، 2-70% خاک مزرعه + 30% ماسه‌بادی، 3- 70% خاک مزرعه + 30% ماسه‌بادی + کود گاوی و 4- 70% ماسه‌بادی + 30% خاک مزرعه + کود گاوی. نتایج آزمایش بیان‌گر اثر معنی‌دار بافت خاک بر تمامی صفات مربوط به عملکرد گل و بنه زعفران بود. مقایسه میانگین‌ها نشان داد که بیشترین وزن‌تر گل، وزن خشک کلاله (به ترتیب 59/1 و 10/0 گرم در هر جعبه کاشت) و وزن خشک گلبرگ (12/0 گرم در هر جعبه کاشت) در تیمار 70% ماسه + 30% خاک + کود گاوی به دست آمد. بیشترین تعداد بنه با قطر 3-2 سانتی‌متر، در تیمار 70% خاک + 30% ماسه + کود گاوی (75/3 عدد در هر جعبه کاشت) و بیشترین تعداد بنه‌ با وزن 6-3 (75/1 عدد در هر جعبه کاشت) و 9-6 گرم (25/1 عدد در هر جعبه کاشت)، در تیمار 70% ماسه + 30% خاک + کود گاوی به دست آمد. افزون بر این، کمترین مقادیر اکثر صفات مورد مطالعه در تیمار 100% خاک مزرعه + کود گاوی مشاهده شد. به‌طور‌کلی، کاشت زعفران در خاک دارای بافت سبک موجب بهبود رشد بنه و افزایش عملکرد گل و کلاله شد. بنابراین، به نظر می‌رسد می‌توان با کاشت زعفران در زمین‌های دارای بافت مناسب و یا از طریق اصلاح خاک و سبک‌تر کردن بافت خاک مزرعه، عملکرد گل و بنه گیاه زعفران را افزایش داد. 1Ph.D. student of Agroecology, Faculty of Agriculture, Ferdowsi University of Mashhad, Iran. 2Professor of Agronomy, Faculty of Agriculture, Ferdowsi University of Mashhad. 3Saffron Research Group, College of Agriculture, University of Birjand. 4Ms.C. of Agronomy, Sarayan Faculty of Agriculture, University of Birjand. This experiment was conducted to study the effect of soil texture on flower and corm yield of saffron. This experiment was carried out based on Randomized Complete Block Design with four treatments and four replications in box at Faculty of Agriculture, Ferdowsi University of Mashhad, Iran, in 2011. Treatments included of: 1- 100% field soil + cow manure, 2- 70% field soil + 30% sand, 3- 70% field soil + 30% sand + cow manure and 4- 70% sand + 30% field soil + cow manure. Results showed that the effect of soil texture was significant on all flower and corm properties. The highest flower and stigma fresh weight per box (1.59 and 0.10 g, respectively) and petal dry weight (0.12 g) were observed in 70% sand + 30% field soil + cow manure. The highest corm number in 2-3 cm diameter per box was obtained in 70% field soil + 30% sand + cow manure (3.75 numbers). Treatment of 70% sand + 30% field soil + cow manure produced the highest corm number in 3-6 g (1.75 numbers) and 6-9 g (1.25 numbers) per box, but the lowest values of most studied indices were obtained in 100% field soil + cow manure. Generally, our results indicated that light soil texture has more advantages than heavy soil texture in saffron cultivation. Therefore, soil modification through lighter soil application can improve saffron flower and corm yield. Anonymous. 2012. Iran Agriculture Statistics (Vol. 2). Ministry of Jihad-Keshavrzi, Iran. 421 pp. Awadhwal, N.K., and Thierstein, G.E. 1985. Soil crust and its impact on crop establishment: a review. Soil and Tillage Research 5 (3): 289-302. Azizi, E., Jahani Kondori, M., and Divan, R. 2013. The effect of soil physiochemical characteristics and field age on agronomic traits of saffron (Crocus sativus L.). Agroecology 5 (2): 134-142. (In Persian with English Summary). Behdani, M.A., Koocheki, A., Nassiri Mahallati, M., and Rezvani Moghaddam, P. 2005. Evaluation of quantitative relationships between saffron yield and nutrition (on farm trial). Journal of Iranian Field Crops Research 3 (1): 1-14. (In Persian with English Summary). Boonekapmp, P.M. 1997. The role of external factors in growth and development of flower of bulb flowers: An update since 1992. Acta Horticulture 430: 35-43. Dole, J.M., and Wilkins, H.F. 1999. Floriculture principles and species. Prentice Hall 537-545. Ebrahimi Khoosfi, Z., Vali, A., Ghazavi, R., and Haghparast, H. 2012. Effects of soil texture components and geometric mean of particle diameter on the spectral response of the soil surface (case study: The part of Khatam dessert, Yazd). Quantitative Geomorphological Researches 3: 115-128. (In Persian). El-Naggar, A.H., and El-Nasharty, A.B. 2009. Effect of growing media and mineral fertilization on growth, flowering, bulbs productivity and chemical constituents of Hippeastrum vittatum, Herb. American-Eurasian Journal of Agriculture and Environment Science 6 (3): 360-371. Gresta, F., Lombardo, G.M., and Avola, G. 2009. Saffron stigmas production as affected by soil texture. Proceeding of Third International Symposium on Saffron, 20-23 May, Krokus, Greece. Gresta, F., Lombardo, G.M., Siracusa, L., and Ruberto,G. 2008. Saffron, an alternative crop for sustainable agricultural systems. A review. Agronomy for Sustainable Development 28: 95-112. Ikram, S., Habib, U., and Khalid, N. 2012. Effect of different potting media combination growth and vase life of tuberose (Polianthes tuberose Linn.). Pakistan Journal of Agricultural Sciences 49 (2): 121-125. Jafarbigloo, M., and Mobaraki, Z. 2008. Evaluation of Qazvin land suitability for saffron cultivation based on multi-criteria decision-making methods. Physical Geography Research Quarterly 66: 101-119. (In Persian). Juana, J.A.D., Córcolesb, H.L., Muñozb, R.M., and Picornella, M.R. 2009. Yield and yield components of saffron under different cropping systems. Industrial Crop Production 30 (2): 212-219. Kafi, M. 2002. Saffron, production and processing. Language and Literature Publications. 276 pp. Khalighi, A., Hojjati, Y., Babalar, M., and Naderi, R. 2006. Effects of cytocinin nutrient treatment and soil texture on quality and quantity Characteristic of onion and scallion in Darwin Hybrid Tulip, Apeldoorn figure. Agronomy Journal in Agriculture and Gardening 73: 58-64. (In Persian with English Summary). Khorramdel, S., Gheshm, R., Amin Ghafori, A., and Esmaielpour, B., 2014. Evaluation of soil texture and polymer impacts on agronomical characteristics and yield of saffron. Journal of Saffron Research 1 (2): 120-135. (In Persian with English Summary). Koocheki, A., and Soltani, A. 1997. Plant Ecophysiology. Iranian Academic Center for Education, Culture and Research, Mashhad. 32-38. (In Persian). Lado, M., Paz, A., and Ben-Hur, M. 2004. Organic matter and aggregate size interactions in infiltration, seal formation, and soil loss. Soil Science Society of America Journal 68: 935-942. Le Nard, M., and De Hertogh, A.A. 1993. The physiology of flower bulbs. Elsevier 617-682. Mahmoodabadi, M., and Mazaheri, M.R. 2012. Effect of some soil physical and chemical properties on permeability in field conditions. 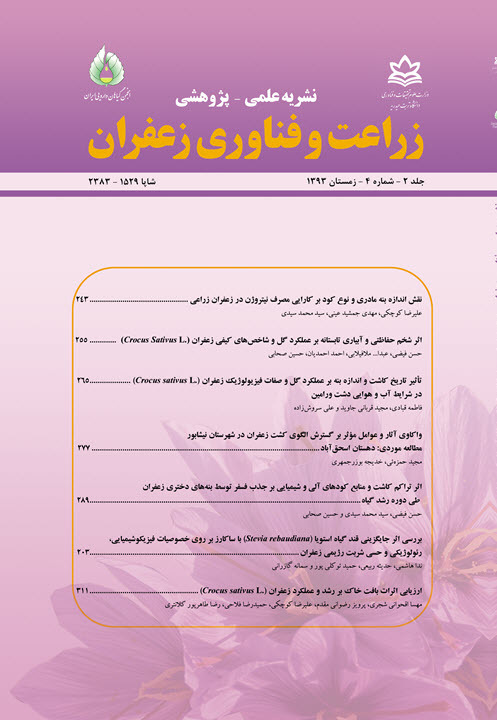 The Iranian Society of Irrigation and Water Engineering 2 (8): 14-25. (In Persian with English Summary). Munshi, A.M., Sindhu, J.S., and Baba, G.H. 1989. Improved cultivation practices for saffron. Industrial Farming 39 (3): 27-30. Naderi-Darbaghshahi, M.R., Khajeh-Bashi, S.M., bani-Ateba, S.A.R., and Deh-Dashti, S.M. 2008. The effects of planting method, density and depth on yield and exploitation period of saffron field (Crocus sativus L.) in Esfahan. Seed and Plant Journal 24: 643-657. (In Persian with English Summary). Pandey, D., and Srivastava, R.P. 1979. A note on the effect of the size of corms on the sprouting and flowering of saffron. Progressive Horticulture 6 (23): 89-92. Raiz, A., Arshad, M., Younis, A., Raza, A., and Hameed, M. 2008. Effect of different growing media on the growth and flowering of Zinnia elegans cv. Blue point. Pakistan Journal of Botany 40: 1579-1585. Sadeghi, B. 1993. Effect of corm weight on flowering of saffron. Research and industrial Institutes of Khorasan Publication, Iran 73 pp. (In Persian). Sadeghi, S., Razavi, M., and Mahajeri, M. 1992. The effect of mineral nutrients (N.P.K.) on saffron production. International Symposium on Medicinal and Aromatic Plants. Acta Horticulture 306: 426-430. Turhan, H., Kahriman, F., Omer Egesel, C., and Kemal Gul, M. 2007. The effects of different growing media on flowering and corm formation of saffron (Crocus sativus L.). African Journal of Biotechnology 6 (20): 2328-2332. Unal, M., and Cavusoglu, A. 2005. The effect of various nitrogen fertilizers on saffron (Crocus sativus L.) yield. Akdeniz Universitesi Ziraat Fakultesi Dergisi 18 (2): 257-260. Wuebker, E.F., Mullen, R.E., and Koehler, K. 2001. Flooding and temperature effects on soybean germination. Crop Science 41: 1857-1861.